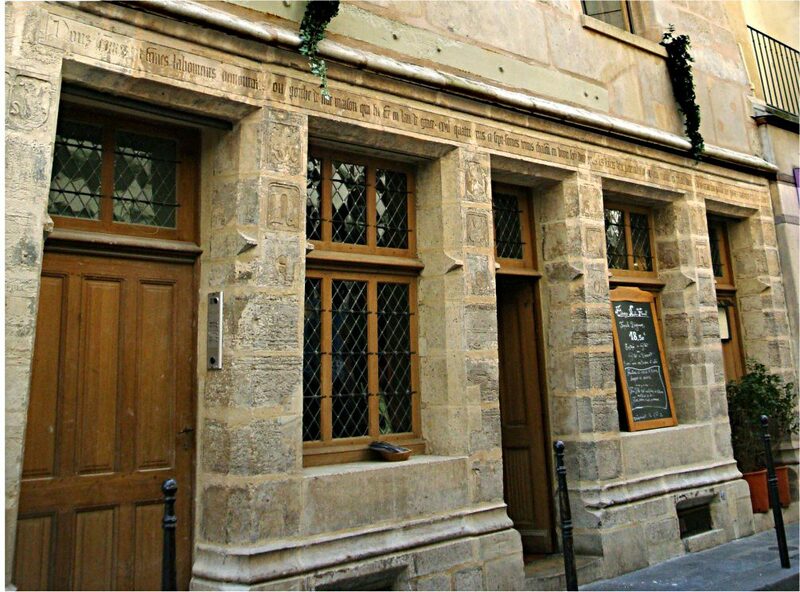 The modest medieval house located at 51, Rue de Montmorency in Paris is off-radar for most tourists. Yet for a niche set of visitors with interests in alchemy and the occult, Harry Potter fans, or both, the building holds special mystique and allure. This is because Nicolas Flamel, the world’s most famous (rumored) alchemist, built the house in approximately 1407 (although, contrary to popular belief, he never actually lived there). 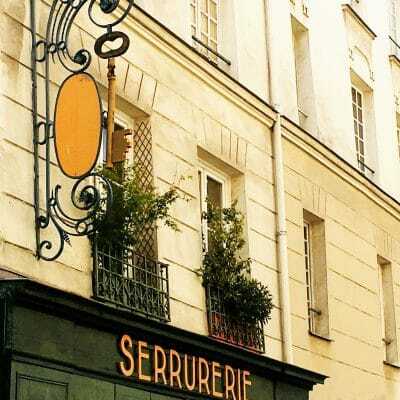 The house has been the subject of much lore centered around the wealthy Frenchman: he is said to have cracked the mysteries of the Philosopher’s Stone, and succeeded in turning metals into gold, within its heavy stone walls. 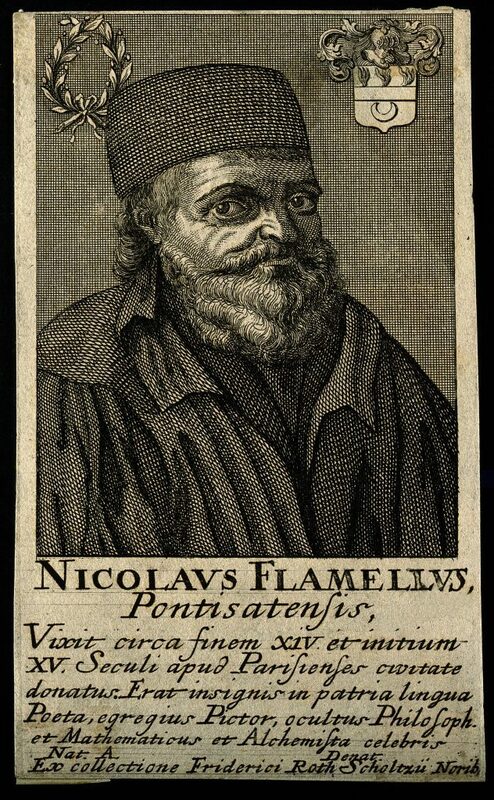 Nicolas Flamel as Philosopher and Alchemist, circa 19th century. Line engraving. 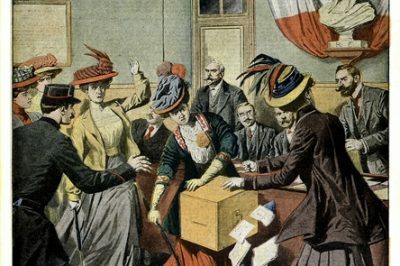 Credit: Wikimedia Commons/Wellcome Library, London. The legend of Flamel is so pervasive and intriguing that J.K. Rowling featured him as a prominent eponymous character in Harry Potter and the Sorcerer’s Stone. Since the release of the bestselling book and blockbuster film, pilgrimages to the house have predictably become far more frequent, including among young visitors. As this goes to press, Rowling’s fictional Flamel is next set to appear in Fantastic Beasts 2, a parallel Potter film franchise. Not to disappoint those of you hoping to visit the home of a genuine alchemist, but historians are pretty much unanimous in their verdict that there’s no evidence for Flamel participating in such activities. A scribe, notary public and bookseller who survived the Black Death and was noted by 15th-century Parisian society for his charitable and philanthropic activities, Flamel was, by all counts, a devout Christian. While this doesn’t exclude him from dabbling in occult activities like alchemy, there’s nothing in the historical record to firmly tie him to these practices. After the death of his wife Pernelle (who also appears as a character in Rowling’s aforementioned book) in 1397, Flamel came into a significant fortune; he used much of his newly acquired wealth to build almshouses for the poor. The stone house that stands on rue de Montmorency is the oldest of these to remain intact. So where did the legend of the gentilhomme bourgeois‘ alchemical prowess come from? 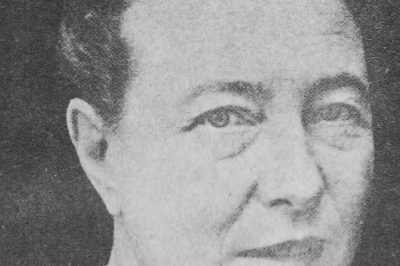 During the 15th and 16th centuries, interest in the occult, and particularly in alchemy, flourished as advances in science and chemistry opened new imaginative arenas. Wealthy middle-class men were often rumored to have been powerful alchemists whose fortune arose from gold they miraculously forged themselves, and Flamel was among them as a Parisian of note from centuries past. His posthumous re-imagining as France’s most successful alchemist first came in a 15th-century manuscript called Le Livre Flamel (The Flamel Book), which attributed authorship to the Parisian. Other texts, poems and manuscripts with alchemical themes later credited him as the author, the most famous of which is a treatise appearing in a print book published in 1612, “The Hieroglyphics of Nicolas Flamel”. The illustrated text presented itself as a translation of a text written in Latin by Flamel in the late 13th century, and presenting numerous alchemical principles and ideas. 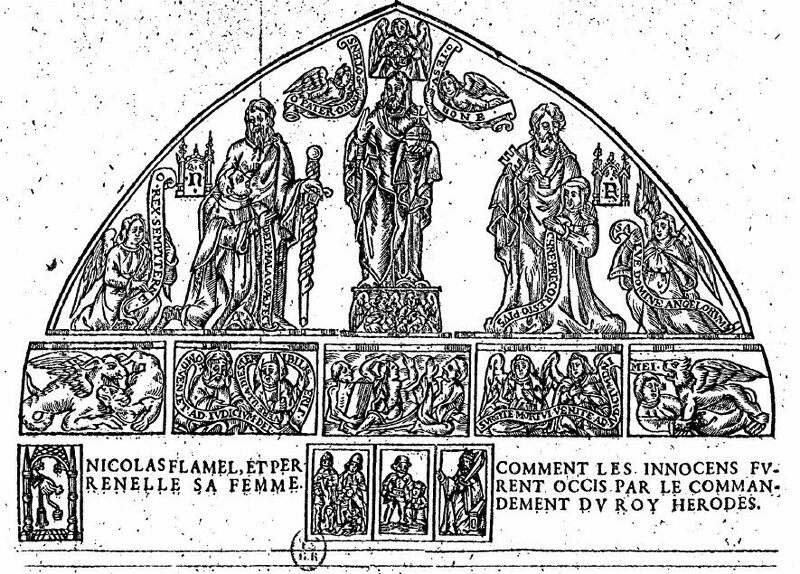 An image from the 1612 treatise “The Hieroglyphics of Nicolas Flamel”. 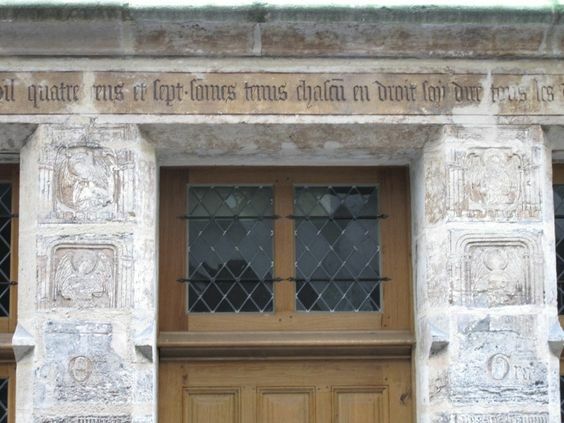 The deeply religious and devotional quality of the inscription is reinforced by etchings in the stone pillars surrounding the door: these depict four musician-angels playing harps and lutes, symbolizing the harmony and joy that await in heaven for those who have found redemption in Christ. 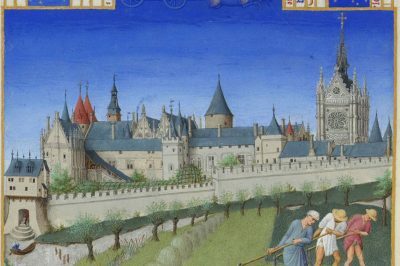 For anyone interested in learning more about Flamel or his legacy, be sure to also pay a visit to the Musée Cluny, where his 15th-century tombstone can be viewed. He was originally buried in a church that burned down in one of the city’s worst fires; all that remains of it is the Tour Saint-Jacques, a tower recently restored to its former glory. 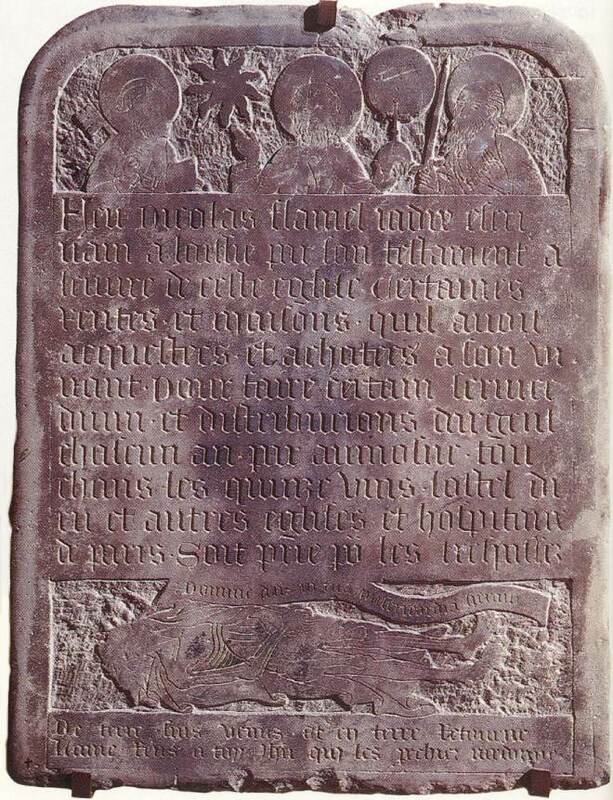 Flamel’s tombstone at the Musee Cluny, Paris. While the historical reality of this interesting figure doesn’t *quite* accord with the legend and pseudo-medievalist cottage industry built around him, visiting these sites in the capital will plunge you into a medieval Paris that is arguably just as fascinating- if not more so. 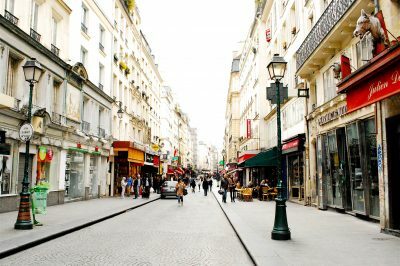 Ready to book your next trip to the French capital? If you’re able to, take the train– it’s more environmentally friendly than flying. You can book tickets and find current deals here (via Rail Europe).